The terms of her father's will leave Everly with no choice but to marry before her 21st birthday in order to ensure the security of her family. Will she be able to get over her anger towards men in enough time to find someone to marry? Answering an ad for a mail order bride, she finds Ben - a man who needs a woman to help him raise his two nieces left in his care. Can they find love while dealing with both a vindictive stepmother who wants to stop her from marrying, and a meddling woman who is determined to take the children from Ben? They will both have to learn to trust, even as the past threatens to ruin everything. it’s also free and what’s better then free? 3.0 out of 5 starsEverly - mail order bride. This is a standard mail order bride book. It has a lot of the same ingredients that other books in this genre have. i.e. a girl who needs to find a groom quickly in order to save her family from poverty. A successful rancher with two little girls to bring up and who need a new mother (in this case his nieces). Everly's father was wealthy and would never marry her mother because she was not of the correct social standing. This made the three daughters bastards, which we would not think anything of today but which was a great stigma then. 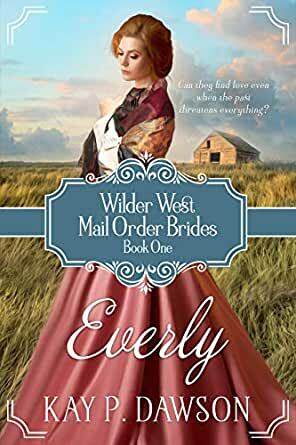 Everly answers Ben's advert for a mail order bride and from then on there is a cornucopia of events before the HEA. I enjoyed this book and as previous review states it is another book about a mail order bride. This book is delightful and does differ from the typical mail order bride book. This book moved along at a good pace and was not drawn. Quite a good read with another view of acceptable life in the times. Kay P Dawson is a beautiful story teller. This little book has a great story line and just made my heart sing. I read it in one sitting. This was the first book by this Author that I read and I thoroughly enjoyed it. I look forward to reading more.